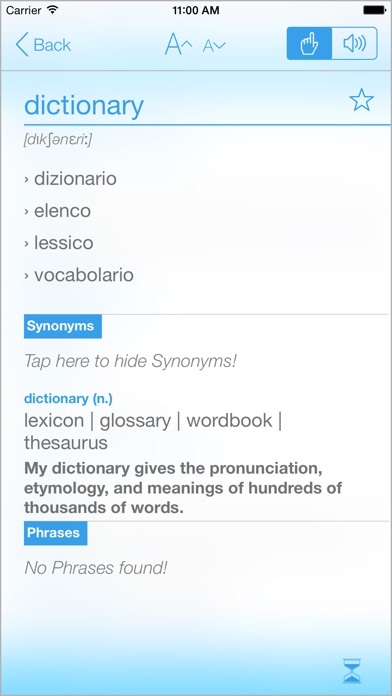 The leading Italian English Dictionary and Translator for iPhone, iPad & iPod Touch * Selling over 5000,000 dictionary apps * More than 55,000 translation pairs * High quality English & Italian speech engine * Integrated Google/Bing Translate * Phrases & Synonyms * No internet connection required (except Google/Bing Translate & Wiki search) BitKnights makes quality apps for people who love or use languages. That's why we have been developing this app for 4 years now, and will continue to do so in the future. 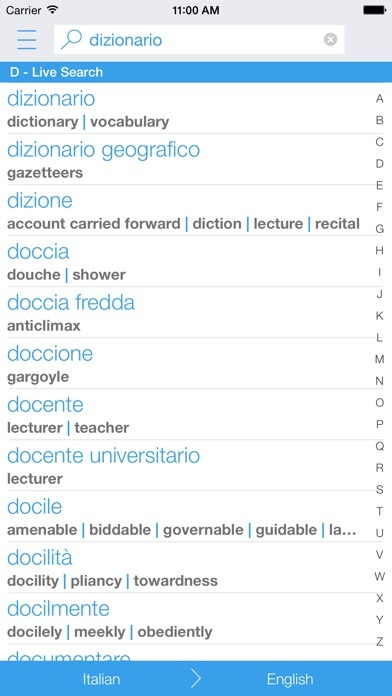 Our Italian English Dictionary & Translator is an easy to use, lightning fast, user friendly dictionary with a huge database. This universal app will run on iPad, iPhone, and iPod Touch, so you only have to purchase it once and you can install it onto all of your devices. 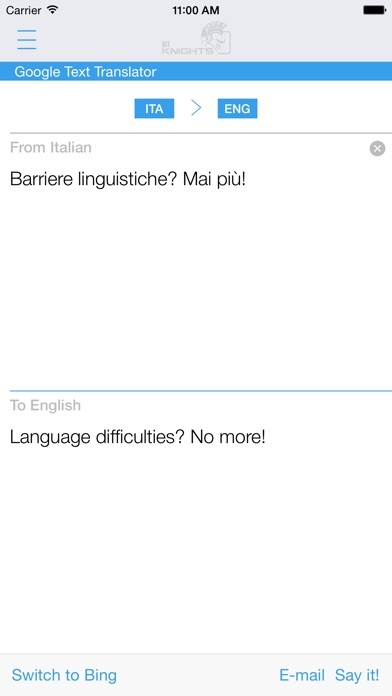 Lightning fast translates from english to italian and italian to english. Features: - More than 55,000 translation pairs - Automatic language detection in search mode - Accentuation independent search - Quick search in browse mode: jumping to the right part of the dictionary while typing - Detailed view of the chosen word with phrases and synonyms - Word linking in detailed view: clicking on any word will show the word in a new detailed view - Speech in detailed view: clicking on any word will pronounce you the selected word or phrase (High quality English and Italian speech via In-App Purchase) - Copy in detailed view: long tapping on any word will copy the word or phrase - English synonyms (via In-App Purchase) - Integrated Google/Bing Translate (via In-App Purchase) - Integrated Wiki search - History of dictionary and translator lookups - Favorites: you can add or remove words - Settings with color schemes (via In-App Purchase) and night mode - Email dictionary translations This LITE version of the Italian English Dictionary and Translator for iPhone/iPad contains third party advertisements. If you'd like an ad free version, you can disable the ads (via In-App Purchase), or upgrade to the full version, which also contains the color schemes and Google/Bing translator. If you like our app, please review it.